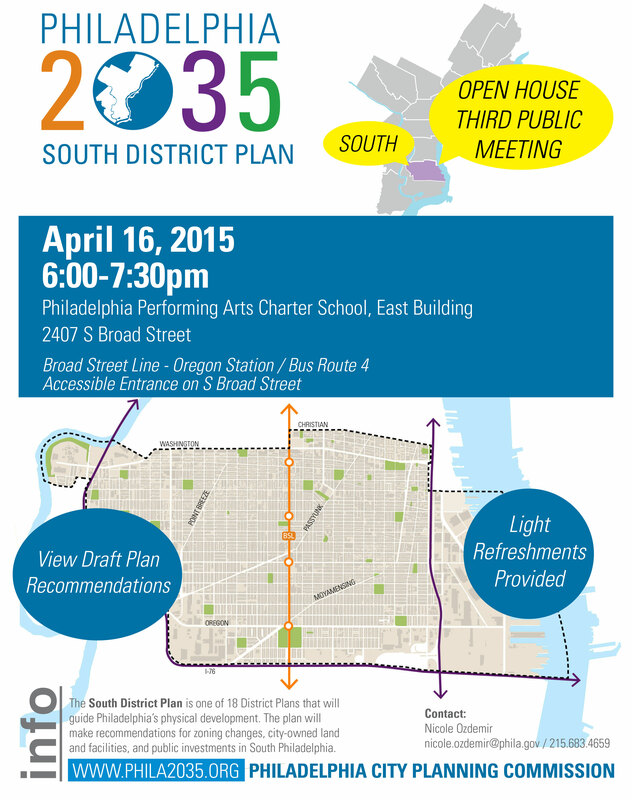 What will South Philadelphia look like in 20 years? Some of those decisions are being made right now. This Thursday is the final planning meeting for the South District. Philadelphia2035 is the city’s currently adopted Physical Development – or Comprehensive Plan. While a physical development plan looks far into the future, it deals with the projects, policies, and changes we need to start making today to create a more livable, healthy, and economically viable city in the future. Philadelphia2035 makes recommendations for actions that the Mayor, City Council, government agencies, and community partners can take to invest in neighborhoods and increase the city’s competitiveness in the global economy. Please come out and make your voice heard. For more information and a summary of what’s happened so far, please visit the South District page of the Philadelphia2035 web site.